The range of on-line coal measurement systems that have been developed by CSIRO have revolutionised quality control in the coal industry in Australia and overseas. This work has led to the establishment of a dynamic industry in Australia that designs, manufactures and markets on-line coal analysis systems worldwide. 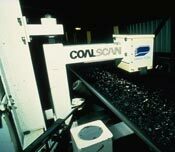 To date the most commercially successful Australian on-line coal analysis systems are the range of Coalscan ash analysers manufactured and marketed by Mineral Control Instrumentation (now Scantech Limited). There are over 400 Coalscan ash analysis systems installed worldwide. The application of these systems has led to industry benefits in Australia alone of at least US$50 million per year through improved process control. Coalscan was recognised by Powerhouse Museum in Sydney as one of the most significant Australian innovations of the 20th century, and the work on Coalscan was recognised by the award of the 1992 Australia Prize. reduced waste material and pollution levels. To do this improved control systems across the full range of industry applications, from mining to processing and use, are needed. These systems rely heavily on the availability of suitable on-line process instrumentation to provide the data and feedback necessary for implementation; after all, ‘if you can’t measure it, you can’t control it’. In the past measurement involved manual sampling followed by sample preparation (drying, mixing, crushing and dividing) and off-line laboratory analysis. However this procedure is often subject to significant sampling errors and, most importantly, the measurements are too slow for control purposes. By contrast, on-line analysis can provide rapid and accurate measurement in real time, opening up new possibilities for improved process control. On-line analysis can also lead to a reduction in the cost of sampling and analysis, and a reduced reliance on sampling equipment. As a result, there has been a rapid increase in the industrial application of on-line analysis instrumentation over the past few decades. In 1963 John Watt began research into on-line analysis techniques at the Australian Atomic Energy Commission (AAEC). Up until the mid-1970s research was concentrated in the minerals industry, with the most important early development being the system for the in-stream analysis of mineral slurries. The Australian Mineral Development Laboratories (Amdel) was license to manufacture and market these systems in 1971. AAEC staff working in this field were transferred to CSIRO in 1982. Research into the on-line analysis of coal began in the mid-1970s as a result of the increase in the price of coal resulting from the ‘oil shock’ of the early 1970s and the rapid growth in the Australian coal industry. This research led to the development of a range of on-line coal analysis systems. In 1982 Mineral Control Instrumentation was licensed to commercialise the CSIRO developed ash monitors, now known as Coalscan ash monitors. Coal consists of combustible coal matter (carbon, hydrogen, oxygen and nitrogen), and mineral matter (mainly aluminium and other silicates and iron). Coal ash is the oxidised incombustible residue from the combustion of coal, mainly SiO2 and Al2O3 and a little Fe2O3. monitoring at coal shipping ports. The ash content of coal is most simply determined by gamma-ray techniques which depend on atomic number (Z), and on the fact that ash has an effective Z greater than that of combustible coal matter. Two of the Coalscan ash monitors licensed from CSIRO are based on dual energy gamma-ray transmission and pair production. The dual energy gamma-ray transmission (DET) gauge depends on the determination of intensities of narrow beam transmission of low and high energy gamma-rays through coal on the conveyor. Both intensities depend on the mass per unit area of coal in the gamma-ray beam and the low energy also depends on the effective atomic number of the coal. The detected intensities are determined separately by pulse height analysis of output pulses from the scintillation detector, and then combined to give an ash content of coal which is independent of the thickness and vertical segregation of coal on the belt. Count rate intensities must be determined over short time intervals due to the combined factors of widely varying load of coal on the conveyor, and the ash content being proportional to the ratio of the logarithms of the intensities of detected gamma-rays. Both gamma-ray intensities must be determined to 0.1 percent. This high precision is achieved by high count rates, gain stabilised electronics, and temperature control of the scintillation detector to within 1 °C. The gamma-ray sources and detector are mounted at opposite ends of the C frame about the conveyor. The C frame is swung under computer control so that the Î³-ray beam either traverses coal at the centre of the belt, or is beyond the edge of the belt during standardisation and calibration. This standardisation is made to correct for drifts in the electronics. The advantages of the Coalscan DET gauge are that coal is measured directly on the conveyor, the measurement time can be made as short as a few seconds making possible rapid coal sorting operations, and a relatively low cost. The main disadvantage of the DET gauge is that its accuracy is fairly sensitive to variations in ash composition. The pair production (PP) ash gauge depends on measurements of the intensities of gamma-rays backscattered by the coal resulting from pair production and Compton interactions. Both interactions depend on the bulk density of the coal; the pair production also depends on the effective atomic number of the coal. The intensities of the backscattered gamma-rays resulting from the two interactions are separately determined by pulse height analysis of the output from the scintillation detector. The detected intensities are then combined to give the ash content. The main advantage of the PP gauge over the DET gauge is that it is less sensitive by about a factor of four to variations in ash composition. The PP gauge views coal in a by-line stream taken from the main process line. The Coalscan sample by-line ash monitor incorporates the PP gauge and a sample presentation system developed by the University of Queensland. This Coalscan ash monitor also incorporates a moisture monitor which uses a capacitance technique for moisture determination, with conducting plates built into the walls of the sample presentation system. Another CSIRO scientist, Ralph Holmes, subsequently adapted the positron-pair principle for on-line monitoring of the iron content of iron ores on conveyor belts. This IRONSCAN instrument was also marketed by Scantech Ltd. In the late 1980s CSIRO developed the world’s first accurate on-conveyor belt instrument for monitoring and controlling the moisture content of coke entering a blast furnace. Coke poses special problems because it conducts electricity, ruling out the use of capacitance or microwave techniques. The CSIRO coke moisture analyser measures the transmission of fast neutrons and gamma-rays through the coke on the belt. It measures the moisture content and belt loading independently of variations in thickness, particle size and density. The analyser was tested on blast furnace feed at BHP in Newcastle in 1989. In traditional iron production the blast furnace’s performance depends strongly on controlling the proportion of dry coke and iron ore in feed. More accurate control stabilised furnace operation, producing a more consistent quality of steel. The analyser was licensed to Scantech in 1989. The coke moisture gauge is the only commercially available moisture gauge capable of accurately measuring coke moisture directly on a conveyor belt. To date commercial gauges have been sold in Australia, Korea and Japan. In the late 1980s CSIRO began research into the development of technologies for the improved control of coal-fired power stations. This involved the on-line measurement of the concentration of unburnt carbon in fly ash as this is central to the efficient control of combustion in coal-fired power stations. Also, the unburnt carbon in fly ash determines whether this waste product can be used in construction industries or if it has to be sent to tailings dams. A patented microwave technique was developed that enabled on-line control to be undertaken in a reliable and cost effective manner. The technique was evaluated in trials at Wallerawang Power Station in New South Wales. The technology was licensed to Scantech in 1990 and to date, over 100 analysers have been installed in Australia, Asia, Europe and North America. This technology has allowed power stations to improve energy efficiency and environmental compliance in emissions and waste disposal. the control and optimisation of many production plants. In the early 1990s CSIRO research led to the development and commercialisation (with Scantech) of microwave moisture technology, and was instrumental in the microwave moisture monitor gaining wide acceptance as the dominant technology for on-line measurement of moisture in bulk materials. Subsequently, CSIRO initiated the development of a novel low frequency microwave (LFM) moisture monitor, which has now been recognised as breakthrough technology by the industry in previously intractable applications in monitoring iron ore, concentrates and thick beds of high moisture coals. The technology has the advantage that it is unaffected by wide variations in the distribution of water in the coal on the belt, and can be used on steel cord reinforced belts that are now common in the industry. The LFM moisture analyser has been commercialised through a CSIRO spin-off company, Intalysis Pty Ltd. Over 150 moisture systems have been sold in Australia and overseas. the dynamic entrepreneurship of the licensee companies in developing international markets. Roughly one third of the total yearly tonnage of black coal mined in Australia is now scanned by Coalscan monitors, which are also being used widely overseas. The economic benefit gained from use of the Coalscan on-line ash monitors in most cases results from control of mining and plant operations closer to the required specification ash content. A number of independent studies have estimated the benefits of on-line ash analysis to average more than A$500 000 per year per installed gauge. Over 400 Coalscan systems have been sold in Australia and overseas with a total sales value of over US$30 million. Sowerby BD, Cutmore N, 2008, Personal communication.